The Rapid Flex Hide-A-Hose provides greater cleaning power, is lighter, more flexible, easier to pull out, and retracts faster. Include mini cuff. New mini cuff connects directly to tools or handle. 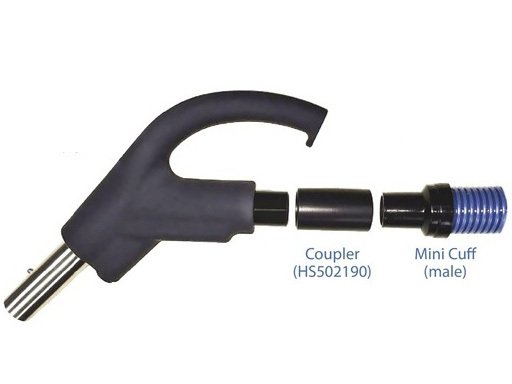 All hoses from Hide-A-Hose will now come with a mini cuff, which will change the connection from female to male. As a result, a handle coupler (included with the hose) is needed to accommodate the smaller cuff on the new hose. 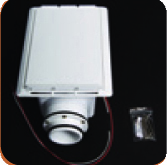 • Greater cleaning power, meaning a smaller unit can be used in some installations. • More flexibility and faster retraction, since the hose is lighter, softer and each coil has a more rounded profile. 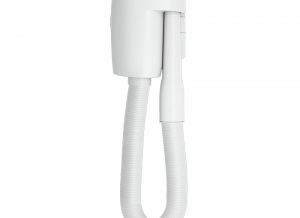 • Easier installation since the hose can handle more turns, multiple planes and tighter spaces. • Rapid Flex hose is more gentle on furnishings than a standard hose since the hose is softer, lighter. Please Note: Over time the Rapid Flex hose may stretch with use. 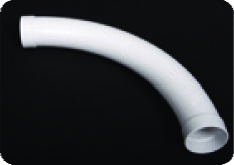 This stretch is permanent and prevents the hose from retracting into the tube system. Hide-A-Hose is working on a permanent solution to correct this, but in the meantime they recommend the following. The fix for current installations: Simply remove the hose end, cut the excessive length and replace the hose end. The fix for new installations: The length of pipe before a standard fitting should be calculated at the length of the hose plus ten feet (eg. 50’ hose + 10’ = 60’ pipe length before the first standard fitting). Failure to do this increases the possibility of the hose-end getting stuck in a standard fitting.